"I am pursuing a double major in Behavioral and Community Health, and French at University of Maryland College Park." "My favorite musical memory is going on tour to Hungary with the Children's Chorus of Maryland." “I love foreign language, and I've been taking French for several years. I'm studying abroad in Nice during the Spring of 2019!" “That's tricky but I really enjoy Chopin's music for piano and love Zoltán Kodály's choral music. I love the emotion that can be brought across in Chopin's music and have always loved the harmonies that Kodály used in his music. I also really like Scott Joplin because once again the harmonies are amazing and his music is so much fun to play. I know that's three, not one, but I can't leave out Joplin." “I really enjoy Ed Sheeran, Big Theif, Ari Lennox, and Vampire Weekend. It's too hard to pick one." "First Love/Late Spring by Mitski"
"Swim, dive, and tennis team!!" "Hmmm I think I'd turn salt purple. That would be pretty dope." "Not gonna lie I don't really watch sports so I don't have a favorite team." “My favorite thing about Lux is how well the group works together. Everyone is a hard worker which results in everything coming so much more easily so we can dig deeper into all of the music. Not only that, but I love what a powerful sound we can get out of such a small group." “Another toughie. I'd say my favorite is Let my Love be Heard ​[by Jake Runestad]. It's a very moving song with gorgeous harmonies and movement." "John Lennon because the Beatles are pretty freakin' cool." “Oh Lord, this question is too hard… I'm gonna go with: I had pet rats as a kid." Abby Hines is a junior at the University of Maryland where she studies Behavioral and Community Health. In the summer of 2017, she started the incredible experience of singing with Lux. She currently sings with the University of Maryland Chorale and is a proud member of PandemoniUM, a student run A Capella group. 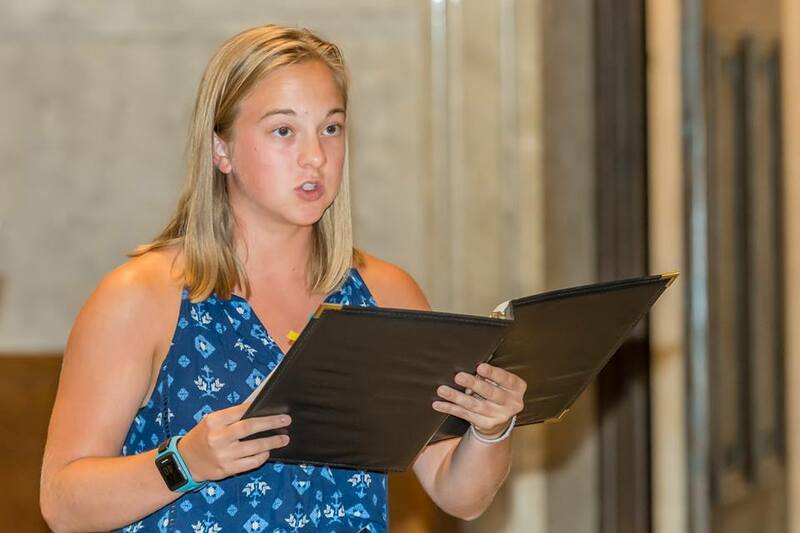 Prior to her transfer to the University of Maryland, she also sang in Gettysburg College’s Concert Choir - a mixed voice choir - and Audeamus - a treble voices ensemble. Prior to college, she sang with the Children's Chorus of Maryland for 7 years under Betty Berteaux, and toured Hungary with them in 2013. She was also a part of the American Kodály Children's Chorus for 3 years under the direction of Dr. Alyson Shirk.